<>"Dear PHP,It's over between us. You can keep the kitchen sink, but I want my MVC. With TurboGears, I was able to shed the most heinous FileMaker Pro legacy `solu tion' imaginable. It has relationships based on fields that change frequently, causing `disappearing data.' I replaced it with an easy to maintain TurboGears application. Defunkifying and normalizing many years worth of munged data took twice as long as developing the TurboGears's application itself. TurboGears's excellent set of tools and best-of-breed approach makes it so easy to build applications quickly." -Isaac Csandl, Manager of Information Technology, Chicago Legal Search, Ltd. "TurboGears has resulted in significant time savings for rPath. Before it was released, we ex pected to spend significant time building a Web framework for our rPath Appliance Agent product. TurboGears sharpens our focus on building a quality application; it allows us to provide more value to our customers, rather than reinventing the Web wheel." -Michael K.
Johnson, rPath Founding Engineer and Coauthor of Linux Application Development, Second Edition "I think this is the first time that a Web framework's functionality has been so obvious. "-Bruce Eckel, Author of Thinking in Java and Thinking in C++ "TurboGears helped me build more complex Web applications more quickly and with fewer headaches than any other framework I've used. Just like Python itself, it made me more productive with a minimal learning curve." -Quentin Hartman, System Administrator "TurboGears has changed the way I develop Web applications, from model, to view, to controller. Thanks to the power of TurboGears, I was able to develop the first version of WhatWhat in less than a week of my spare time." -Jonathan LaCour, Development Team Lead, Optio "TurboGears has provided a way for me to greatly enhance my productivity by real izing the potential of Web-based agile development with Python. "-Brandon Goldfedder, Vice President of Engineering, Information Extraction and Transport (IET Inc.), and Author of The Joy of Patterns "TurboGears really changed the way I schedule project releases: It allows me to deliver them faster and with better quality than when I used to use GUI toolkits. "-Jorge Godoy, Owner of G2C Tech Consultoria in Brazil, former Lead Developer for Conectiva documentation team "With TurboGears, I was able to transition my Python projects into Web applications as easily as possible." -Benjamin T.
Hamilton, Software Engineer "Norwegian-based company Scanmine AS makes extensive use of Python and Turbo-Gears in all parts of its operation. TurboGears makes it a breeze to build highly sophis ticated Web 2.0 applications with out-of-the-box features for multiple languages with full Unicode, REST, AJAX, RSS/Atom, and more. This enables Scanmine to put a face on their technology development in a minimal amount of time. "It has been said that there are as many Web frameworks as there are Python Web programmers. This apparent Web framework fragmentation has long been perceived as a weakness, until TurboGears came along and turned weakness into strength." -Rune Hansen, Senior Systems Designer, Scanmine AS "TurboGears is a well thought-out framework; the design choices it has made will help you be more productive. TurboGears will give you confidence with its foundation of stable best-of-breed Python components. If you are coming from other languages, consider working in TurboGears and Python to bring fun back into your Web develop ment work." -Jeff Marshall, Partner with FrozenBear "When we started developing Oprius Foundations with TurboGears, we weren't sure if it really would help us develop quicker and higher-quality code. After two months, we had a task manager to rival Tada List. After seven months, we had an entire contact management system to compete with the big boys." -Jason Chu, Lead Developer, Oprius Software Inc. "Conventional programming wisdom states that rewriting any working project from scratch is a bad idea. TurboGears was good enough to convince me to do this anyway, and I have been nothing but thrilled with the results. With TurboGears, I was able to implement an AJAX-based Web site with a nice Web API more easily than I ever thought possible. If you are trying to do either of those in Python, you owe it to your self to look at this project. Using TurboGears was one of the few times in my program ming career where a task was significantly less complicated than I thought possible." -Adam Jones, Lead Programmer, RecursiveThought Software Master TurboGears: The Easy Python Framework for Rapid Web Development TurboGears harnesses the power of Python to provide a dynamic and easy-to-use Web development framework: one that dramatically increases developer productivity, and makes it far easier to create dynamic, user-friendly, Ajax-enabled Web applications. Now, for the first time, there's a definitive guide to TurboGears-coauthored by its creator, Kevin Dangoor. 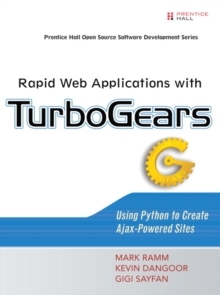 This book will help experienced Web developers get productive with TurboGears-fast. You'll quickly build your first TurboGears Web application-then extend it one step at a time, mastering the underlying libraries that make these enhancements possible. Next, the authors demonstrate TurboGears at work in a real-world application, by examining the code for "WhatWhat Status," an open source project status tracking application.